Web history allows you to view and search across webpages you’ve visited in the past, find trends on your web activity, and get more personalized search results based on what you’ve searched for and which sites you’ve visited. Your Web History is accessible only by signing in to your Google Account. Which sites do you visit frequently? How many searches did you do between 10 a.m. and 2 p.m.? Web History can tell you about these and other interesting trends in your web activity. 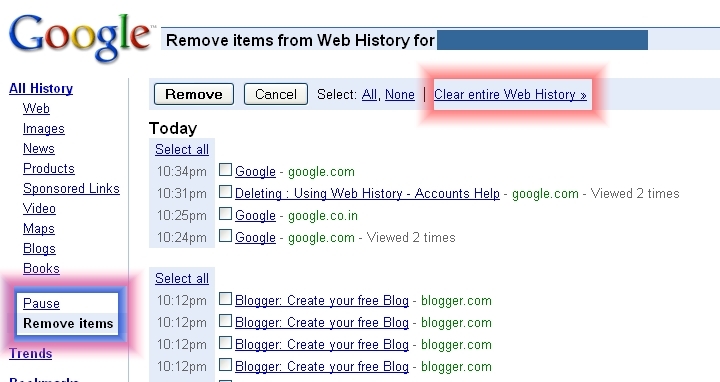 You can pause, remove selected items and clear entire web history by clicking respective links. Even you can see your searched query trends i.e. top queries, top site, top clicks.